HULK’S ONE QUESTION INTERVIEWS: PATTON OSWALT | Birth.Movies.Death. Hulk submits the first in a new series of one-question interviews. THIS IS THE FIRST ENTRY IN AN ONGOING SERIES OF INTERVIEWS! IN CASE YOU MIGHT NOT HAVE NOTICED, HULK-ARTICLES ARE KIND OF FREAKIN' LONG! SO HULK WAS HOPING TO INTRODUCE SOMETHING INTO THE FOLD THAT RAN AGAINST THE GRAIN AND CAPTURED A SENSE OF POETICISM. SO BEHOLD, THE 1 QUESTION INTERVIEW FORMAT! HULK DELIGHTED WITH THIS FIRST ENTRY BECAUSE HULK THINK IT PERFECTLY ENCAPSULATE THE THOUGHTFULNESS, BREVITY AND OPEN-ENDED-NESS THAT HULK HOPED TO ACHIEVE WITH THE SERIES. 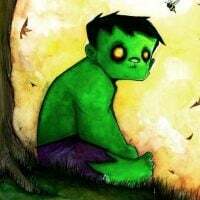 AND RATHER THAN RESPOND IN ARTICLE, HULK WILL FURTHER RUMINATE THE ANSWER IN COMMENTS. SUBJECT #1: PATTON OSWALT IS A BRILLIANT COMEDIAN, WRITER, ACTOR, NERD-DEMI-GOD WHO YOU PROBABLY KNOW ALREADY. TO SOME FOLKS' AMAZEMENT, HE BRILLIANTLY CHANNELING ETHOS & PATHOS CURRENTLY IN YOUNG ADULT, BUT TO OTHERS THIS JUST ANOTHER STEP IN A LONG LINE OF GREAT WORK. HULK'S FAVORITES INCLUDE BIG FAN, HIS EXCELLENT BOOK ZOMBIE SPACESHIP WASTELAND, AND A DELIGHTFUL RECURRING STINT AS PROFESSOR DEMENTOR ON KIM POSSIBLE. AND NOW PATTON HAS GRACIOUSLY ACCEPTED TO BE HULK'S INAUGURAL INTERVIEWEE. HULK: IN THE FILM RATATOUILLE (OF WHICH YOU HAVE AN OBVIOUS AND CENTRAL ROLE) THERE IS AN AMAZING SCENE WHERE ANTON EGO LOOKS OVER HIS LIFETIME OF CRITICISM AND PHILOSOPHIZES ON THE RELATIVE USEFULNESS COMPARED TO ANYTHING THAT IS CREATED, IMPLYING A WIDE SPECTRUM BETWEEN THE TWO. ONE OF THE THINGS THAT HULK FINDS SO FASCINATING ABOUT STAND-UP COMEDY IS THE COMEDIAN CAN ESSENTIALLY BE BOTH. SO HULK'S QUESTION THIS: DO YOU BELIEVE COMEDIANS SHOULD OPERATE MORE AS CREATORS / STORYTELLERS OR MORE AS CRITICS? TO REFINE THE QUESTION: THERE IS OBVIOUSLY A RANGE OF COMICS WHO FUNCTION AS EITHER OPTION, OR MERELY BASE IT ON THEIR PERSONALITY, BUT WHAT DO YOU BELIEVE IS MORE ACCURATE TO THE TRUE INTENTION OF STAND-UP? A ONE SENTENCE ANSWER THAT BOTH REFINES THE QUESTION AND ANSWERS IN A NUANCED MANNER? BOOM. HULK DELIGHTED. AND FEEL FREE TO ANSWER THE QUESTION YOURSELF BELOW! In which the geeky alt-comedian dissects Batman's arch nemesis in THE DARK KNIGHT. Jason Reitman and Diablo Cody's second team-up is their overlooked masterpiece. New Patton on October 17th! This is not a drill!